6-seat progressive jackpot Sit and Gos. Allows avatars to be uploaded. No action in uncommon games. As one of the largest online poker rooms on the Microgaming Network – in addition to access to the well-trafficked Microgaming player pool – Unibet Poker is capable of offering exclusive online poker promotions and No Limit Hold’em cash games available solely to Unibet Poker patrons. This unique relationship between Microgaming, and a select number of their partnered online poker rooms, allows Unibet Poker to grow and flourish as an independent poker room, while maintaining the benefits of an affiliation with a much larger network of players. 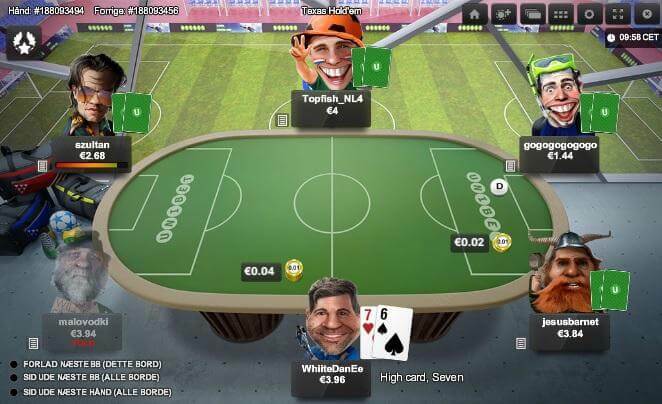 Utilizing software developed by Microgaming, Unibet Poker offers a solid and reliable online poker platform, substantial traffic in the most popular poker forms in the EU, live event qualifiers, an extensive tournament schedule, and enticing online poker promotions. A live chat support option allows players to receive immediate help with any issues they may have, among numerous other contact methods. Unibet Poker is powered by software developed by the Microgaming Network, providing a highly functional and secure online poker platform. Packed with all of the latest features and customization options, the Unibet Poker software is both user-friendly and flexible. Players may upload their own avatar images, if desired, and the table graphics are cleanly scalable and nicely arranged for convenience. Multi-tablers can enjoy playing cash games at as many tables as they can possibly manage, and view table stats from the lobby, as well as personal stats at the tables. The Microgaming Network receives a traffic flow that peaks in the upper thousands, though the majority of players are concentrated in the variety of Sit and Gos and multi-table tournaments available 24 hours a day at Unibet Poker. Still, thousands flock to the cash games, primarily the No Limit Texas Hold’em tables, with the Pot Limit Omaha games following at a distant second. Unibet Poker’s exclusive Texas Hold’em ring games consistently draw players numbering in the hundreds. The Fixed Limit Hold’em and Pot Limit Omaha Hi-Lo tables attract a much smaller group of active players. However, the 7 Card Stud, 5 Card Stud, 5 Card Draw and Razz tables at Unibet Poker (and across the entire Microgaming Network) are usually empty. The major attraction at Unibet Poker is the broad range of tournaments, satellites, Sit and Gos and freerolls. Daily guaranteed tournaments, satellites to the bigger weekend tournaments, and regionally freerolls run round-the-clock. Jackpot Sit and Gos offer exciting progressively increasing jackpots for STT lovers, and leaderboard challenges issue extra cash prizes to the MTT enthusiasts who earn the most points over the course of the competition. Players are supplied with an extensive selection of games to choose from at Unibet Poker. All of the limit variations of Texas Hold’em, Omaha and Omaha Hi-Lo are present, though finding action outside of the most commonly played limits is nearly impossible. The Microgaming software also provides the less common games of 7 Card Stud, 5 Card Stud, 5 Card Draw and Razz, but again, finding someone to play against is a challenge in itself. PowerPoker has a rich variety of poker players due to being EU based and supported for players from the US. Because of this, players battle on PowerPoker all over the world and this has a great impact on the gameplay. The typical player is very soft, especially at stakes under $3/$6 NL Hold’em. We particularly recommend the juicy Omaha tables. New players at Unibet Poker can earn up to $0 in sign up bonus cash with our exclusive Unibet Poker bonus code: . Once players have registered their account with Unibet Poker, they will have 10 days to activate the Unibet Poker bonus by logging into the online poker software. Once activated, all of the VIP points earned in raked cash games and tournaments with entry fees will be counted toward the release of the poker bonus over the next 60 days. The Unibet Poker bonus will be released in 10 equal installments, paid directly to the player’s real money online poker account as the required VIP points for each increment of the bonus are accumulated. Unibet Poker features a 5-tier player loyalty reward system called Unibet Poker Club. Loyal players can earn weekly bonuses relatively to the amount of points they accumulate by playing Unibet Poker’s real money online poker games. Players at the 3rd tier and higher of the Unibet Poker Club may exchange a percentage of their VIP points for cash. VIP points may also be used to purchase items from the Unibet Poker online store. At the highest level of the poker club, Unibet Poker places $10 into a live poker fund for every $100 the player rakes. The live poker fund may be used to buy a seat at any live tournament with a buy-in of at least $1,000. Online poker promotions at Unibet Poker include WSOP main event packages, rake races with over $100K in prizes, and the increasingly popular progressive jackpot Sit and Gos; now available in 6-seat STTs in both normal and Super Turbo formats. 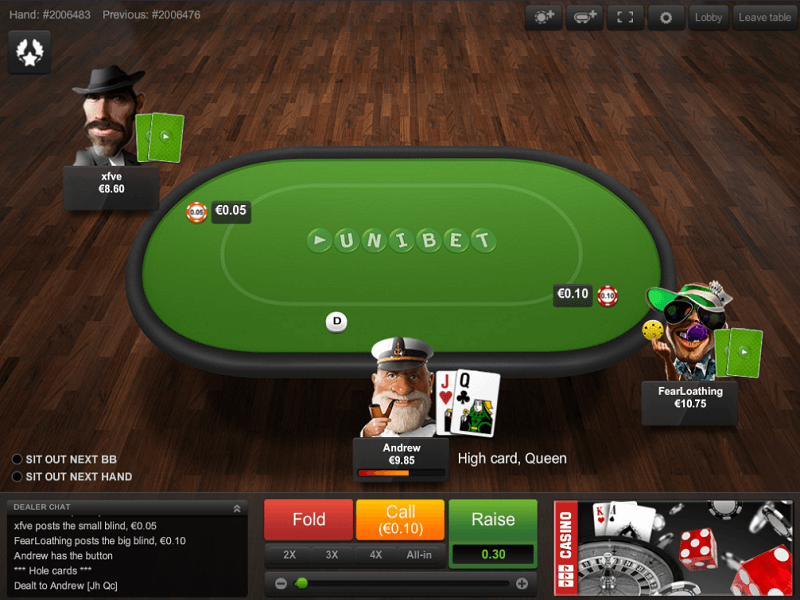 Unibet Poker also features “Anonymous Tables” in which players can enjoy playing Texas Hold’em cash games in total anonymity. Offering the full range of support contact options, Unibet Poker customers may reach a support staff member via live chat, telephone, fax or email. 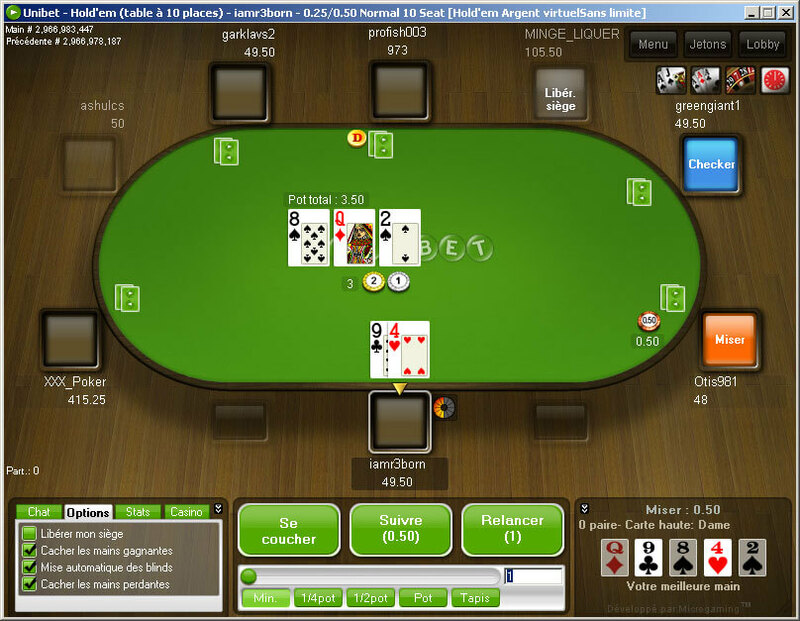 Unibet Poker also provides a FAQ with answers to the most newcomer questions. Deposits: Visa, MasterCard, Visa Electron, Delta, Moneybookers, NETeller, Paysafecard, Ukash and Wire Transfer. Cashouts: Moneybookers, NETeller and check.